This was the last year of the C2 chassie that started in 1963. The optional aluminum bolt on wheels were unique for this model. Emergency brake handles were moved to between the seats from under the instrument panel. This was the first model with standard 4-way flashers and dual master cylinder. Engine displacement came from the basic 300 HP to the 435 HP L71 427 CID engine. 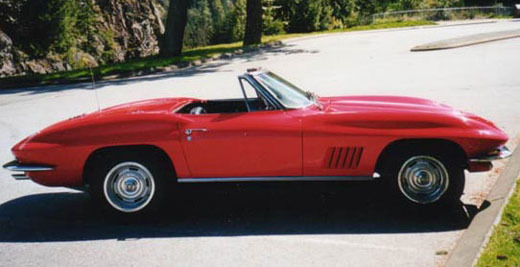 Some 20 500 HP L88 427 CID engine equipped Corvettes were sold in 1967. A mighty demon.